CRM for mobile allows you to interact with your device by making it possible for you to contact prospects on the go. wMobile offers both a mobile and desktop/browser user interface. The wMobile product is a web based client for GoldMine based CRM systems Users access wMobile from their desktop computer, tablet or phone. wMobile enables GoldMine users to access the functionality of GoldMine in a lightweight web client. wMobile delivers an automatic email archiving service that allows your users to use any email client including their phones native client. Any email matching GoldMine contact email addesses will be automatically filed into contact history. wMobile displays your contacts location on a map, it generates turn-by-turn directions to the contact and shows which contacts are in close proximity to the contact. Proximity is available with GeoCoding option. wMobile delivers a built in Google and LinkedIn tab for quick and easy research related to the currently viewed contact record. Other internal or external websites can be easily added. Quickly review key statistics from the GoldMine system. A dashboard displays information such as the number of completed activities and new contacts added to the database. Key metrics such as calls completed, sales completed and emails processed are viewable for individuals and teams based on security rights. A designer application is included to allow additional changes to the wMobile user interface. Administrators have a central application to manage users, wMobile configuration and security settings. Information updated on a wMobile device is immediately applied to your GoldMine system without the need for data replication. 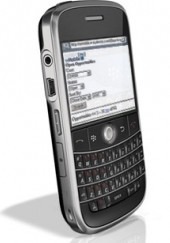 wMobile supports all phone devices such as Blackberry® , Palm Treo®, Windows Mobile® and iPhone®. wMobile supports all worldwide mobile phone carriers and systems with internet data service. wMobile Desktop Edition supports desktop web browsers such as Internet Explorer, Firefox, Chromer and Safari on Windows and Apple computers. A video demonstrating how to manage your GoldMine calendar with wMobile. wMobile Phone is supported on any mobile device with an intenet connection and web browser.